A1 Catering & Events, LLC and its affiliate companies started doing business in 1975. We have always been family owned and operated and our business is built on honesty, integrity and complete customer satisfaction. Our experience in event entertainment provides you the latest and most exciting interactive games and inflatables in the country today. From FOOD to FUN, we supply everything for your event. A1 Catering & Events, LLC is an all in one full service events planning company that has the latest and most exciting interactive games and inflatables for all ages from kids to adults. You are busy enough! Let us do all the work so you can sit back and relax. 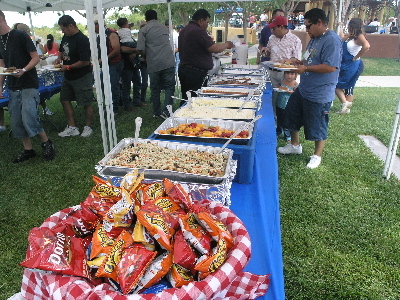 We have a world renown BBQ style catering service and we specialize in corporate events, annual company picnics, team building, trade shows, themed events, grad nights, Christmas parties, casino parties, and more. You will be pleased with our friendly and energetic staff. We are a direct source for all of your food, entertainment and equipment needs. We offer a great price and use the best entertainment available for your budget, including in-house custom catering, props and decor for your special event needs, clowns, face painters, magic acts, balloon artists, dance acts, national and local bands, karaoke, disk jockeys, hypnotists, jugglers, mimes, and more!! !